If we want a new race conversation, we’d better start with a better approach to race polling. Earth to everyone. It’s not a black and white world anymore. Especially not in the U.S. So why are polls on race, in their execution and their findings, still mired in a polarizing black/white paradigm? The world is too nuanced for just black and white answers. There are others in the mix, and large groups of others, like Asians and Hispanics. And yet time and again, in many polls, these large groups are treated as if they aren’t even in the conversation. 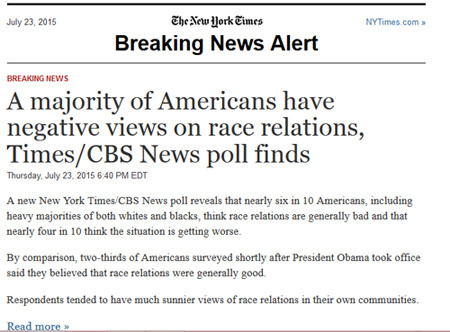 Case in point: Did you see that new New York Times/CBS poll on race relations? Breaking news? Really? Like an ISIS threat? No, just another race poll. So now we know how low we’ve sunk. We’re just back to the early 2000s. All the poll really proves is that we tend to feel good when good things happen. And we tend to feel really, really bad when cops shoot black people and when a white racist shoots black churchgoers. After nine people are killed in an historically black church in Charleston, after racially charged police violence in South Carolina, Baltimore, Staten Island, and Ferguson, I don’t need a poll to tell me race relations are poor. It’s the reason I quickly read through the “things are terrible” story to see what Asian Americans thought. Or what Latinos thought. About anything. I couldn’t find much. Apparently, we don’t count. The guts of the poll reveals some Asian Americans were surveyed, about 4 percent. But not enough of a sample to say with any authority what Asian Americans think. Same with Latinos. Just 15 percent. It’s typical of the shortcomings of polls. Sure, there was a random sample of cell phone users. But to really get the opinions of Asians and Latinos, you need to oversample, and even poll in languages besides English. Otherwise, it’s just a poll on race in black and white–not in color. It’s just part of the story. As a journalistic problem, this is similar to the Times relying just on official government sources in major stories involving the Middle East, as pointed out by Glenn Greenwald. (Coincidentally, it was the same problem with the way the Times reported on the Wen Ho Lee story). This full partial poll on race is the kind of poll that makes you hate polls altogether. You may already barely tolerate political polls, but at least with candidates, it’s simple enough. It’s a horse race. But where’s the horse race on the poll on race? Today we hate each other, yesterday we loved each other? Does that really help? Does it feed or confirm stereotypes, or become a dangerous self-fulfilling prophecy? I’d say a more nuanced poll that sampled broadly and were more inclusive of Asian American and Latino sentiments might show less concern about race, more concern about other things, like economic inequality. But leaving us out, once again, reminds us that Asian American opinions don’t really matter. But doesn’t that vaguely sound like a sentimental yearning for the good old segregated days? That’s how the bulletin ended, and now back to your sunny, carefree summer. That is, until the real breaking news story of the day—the theatre shooting in Lafayette, Louisiana. The shooter, now identified as 59-year old John Russell Houser, may have been the angry white male, but he didn’t discriminate. He seemed to shoot at everyone in that Lafayette movie house, leaving three dead and nine wounded as of Friday morning. I wonder if he was offended by Amy Schumer’s joke about her not having any pictures of black friends in her iPhone. She had one picture of a black waitress. 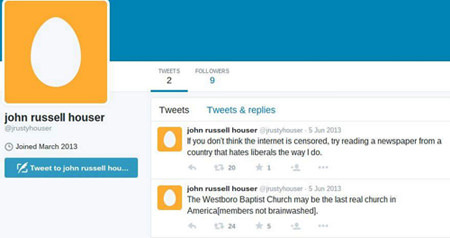 There is one twitter account that could be Houser’s. It bears a tweet from 2013, in which Houser praises one of the most rabid hate groups around, the Westboro Baptist Church. The tweets ended back in 2013. Houser probably wasn’t one of the whites who participated in the New York Times race poll. But you know there are many who share his sentiments out there. We don’t need a poll to know that. But in the end, we’re right back in the same place we started. There’s just one question to ask, and it’s not a poll question: Exactly what are we going to do to make it all better?